An exhibition of Mäori fish-hooks (matau) made from wood, bone, stone, and shell opens at Te Papa on Saturday December 4th. 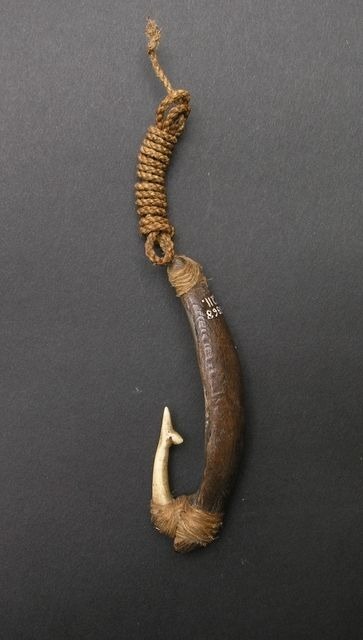 While early European explorers considered these fish-hooks to be ‘ill-made’ and ‘of doubtful efficacy’, research has shown that the design was highly effective. Unlike modern steel hooks, the Mäori hooks were attached with fishing line tied to a groove at right angles to the direction of the point. This caused the hook to rotate, trapping the fish’s jawbone rather than piercing the fish. Bones from giant moa and stranded whales could be used to make large hooks, but bone alone was not strong enough to catch big fish, such as shark and groper. 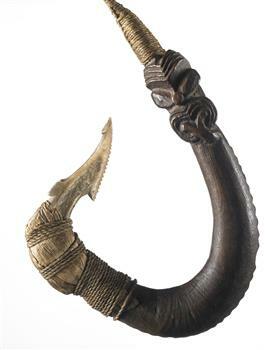 Hooks targeting these species incorporated additional materials for greater strength and large hooks were constructed with strong wooden kauawhi (shanks) made from dried saplings or branches, with stout bone or shell points. As well as hooks, Māori used a range of trolling lures to catch fish. All were dragged behind canoes without bait, but they differed in design and materials depending on the fish being targeted. Oceanic fish such as tuna and kingfish were caught with pā, straight lures with the line extending along the shank. Pohau mangā were long wooden lures; the line sat protected within a groove at the tip, making them ideal for fish such as barracouta whose sharp teeth could easily cut a flax line. Smaller coastal fish were caught with pā kahawai, curved lures traditionally made from a pāua shell rim and sometimes decorated with feathers. Europeans introduced Māori to metal fishing hooks in the late eighteenth century. The new materials and tools were quickly embraced and old matau were thrown away, and the wooden and flax components soon decomposed. Meanwhile, bone and stone matau acquired new significance as highly collectible artefacts. To meet the growing demand from collectors and tourists replica matau were made in large numbers by Māori, and also by European forgers. 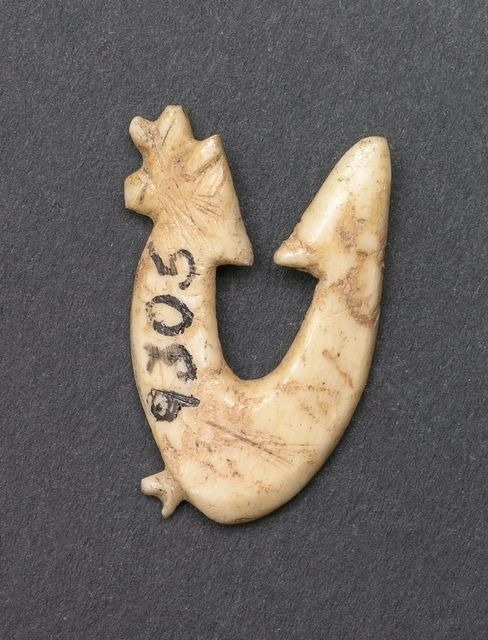 The first Europeans observed Māori wearing fish-hooks as pendants, but for essentially practical reasons. Traditional Māori garments lacked pockets, so small tools – including matau – were often worn on a string around the neck for safe-keeping. If the tool was made from sought-after pounamu, the pendant had extra value beyond the functional. 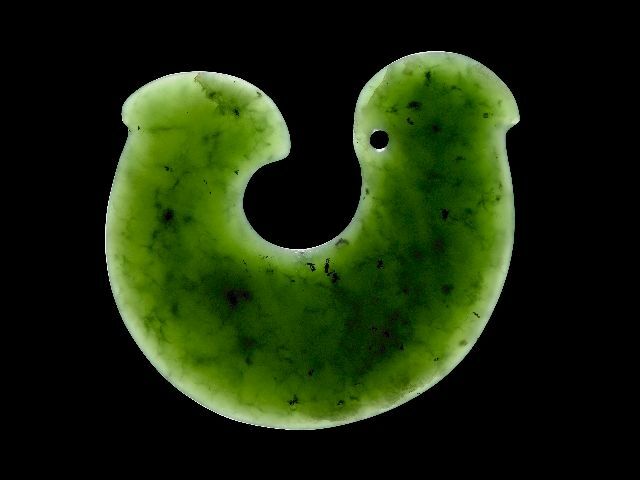 In recent years, stylised fish-hooks made of bone, ivory, or pounamu (greenstone) have become popular as pendants. Many wearers not only appreciate the beauty of these ‘hei matau’, but also value them as potent symbols of Māori cultural renaissance. The fish did not swallow the entire hook: the bone of a fish jaw is quite narrow in cross-section, so when the fish tries to swallow the bait, its jaw slips through the gap of the hook – when the hook rotates, the jaw is then at right-angles to the gap and too broad to slip back out. Estimating the age of the hooks is difficult. Most hooks were collected in the late 1800s, but although there are often good details of who collected them, when and how they acquired the hooks is generally unknown.